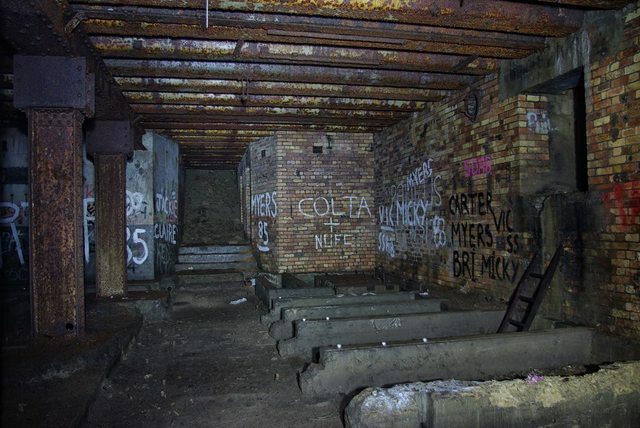 Roberts Battery is located at Hartley - a small coastal village north of the River Tyne. This battery formed part of the 'Tyne Turrets' - the coastal defence was impressive and used two 12-inch Mk VIII guns from the battleship HMS Illustrious. The other gun battery being south of the Tyne at Marsden - Kitchener Battery. Information about the batterys is scarce (probably due to the secretive nature) but snippets can be found if you look around..
OK where to start? Well apologies for being so quiet of late - I still get out exploring and recording things but life has taken a slight twist. I won't bore with the details here! 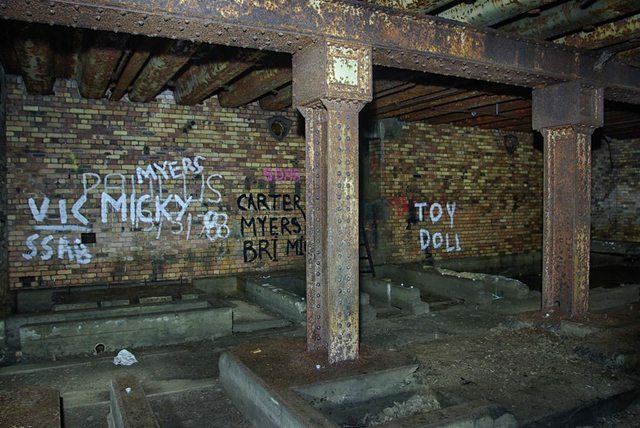 I last explored Roberts Battery back in the early 1970s. I had no camera but did have some incredible memories of the place. It was literally like nothing I'd ever seen before - the realisation that Britain had been at war and it'd been so close to home. Long story short this site was sealed up. Access could be had in several ways until that point but now it was off limits but did stay on my radar.. Nature is wonderful. Nature always finds a way. I've monitored this site for decades hoping the elements would allow me back in.. and they did! This time though I'm more equipped - gas detection (seriously important here), decent cameras, lighting etc but most importantly the skills gained through mine exploration. Autumn had begun and everything was in my favour - if it wasn't done now then I'd have to wait another year. I won't go into detail on that last part. 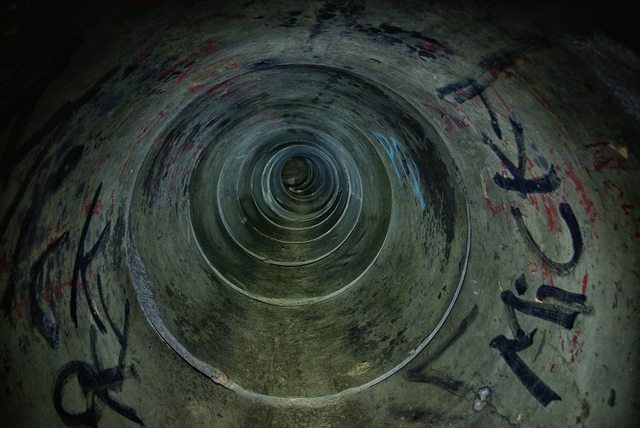 Down the dark dark pipe, there's a rubbish tip I had to tunnel through sideways! 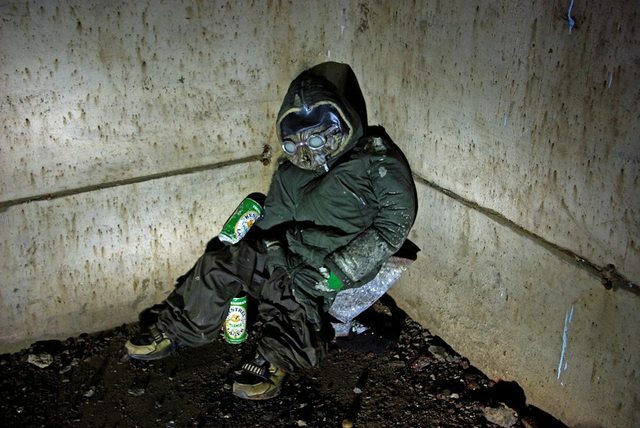 Once through that rubbish tip I literally dropped into the soldiers latrine. 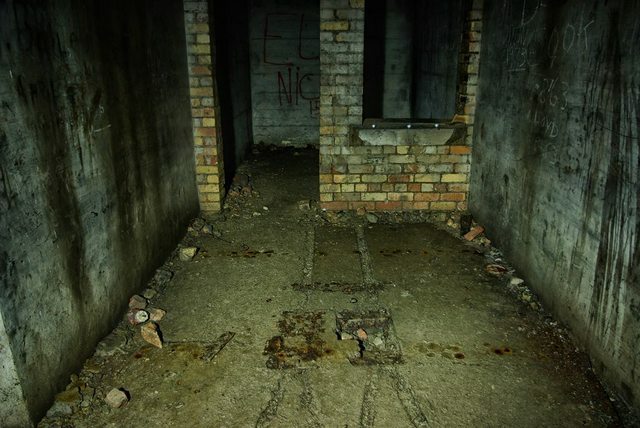 Upon exiting the latrines you see this room. 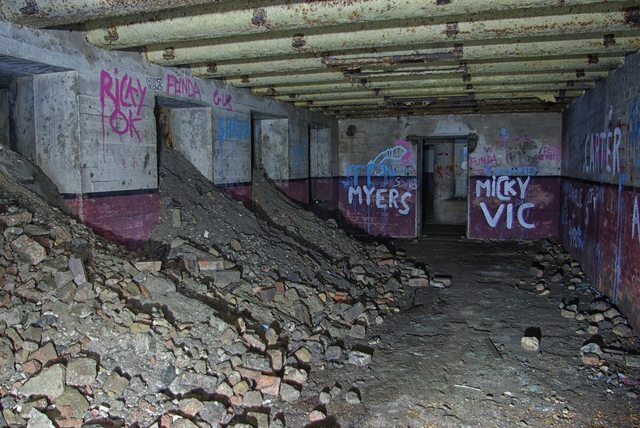 I suppose a mess room of sorts. The windows to the left opened into a deep open topped corridor which had access to the surface. That infill is rubbish too and basically used to seal up and make safe the ground above and around the site. These days I expect most people don't realise just what's beneath their feet. The far door in that last pic takes you to a central passage which runs East to West. Let's turn West..
You can still see where metal rails and points were. 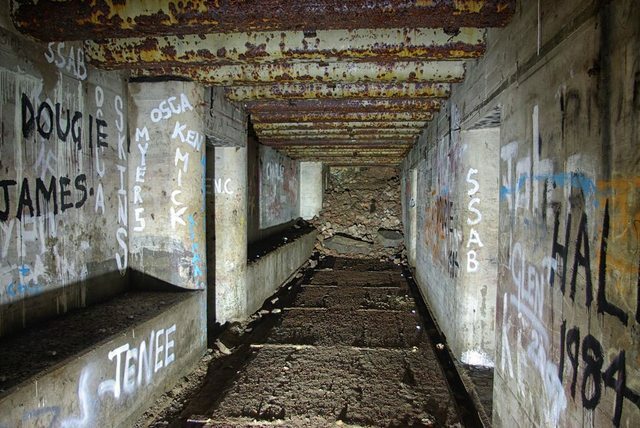 They'd have used the rails to haul shells and supplies around the underground site. Looking East from those rails (directly the opposite way) you then see directly through the middle of the complex. Rubble and tip is spewing down from rooms to the left and beyond too. It's at that far end where the actual gun was placed directly above. I was unable to access magazine rooms due to infill. Lets go clockwise through some rooms then. This was an engine room. Basically engines which powered the hydraulics which then powered the gun mechanisms. It's not a nice place! Some of the floor is hollow beneath that old concrete - the hollow sections originally held the hydraulic oils for the pumps. Nowadays they're filled with greenish oily water which has masses of old metal pieces in it - fall in and yer probably dead.. I particularly like the riveted metalwork in the engine room. Pretty but very industrial and strong. Another pic of the engine room. 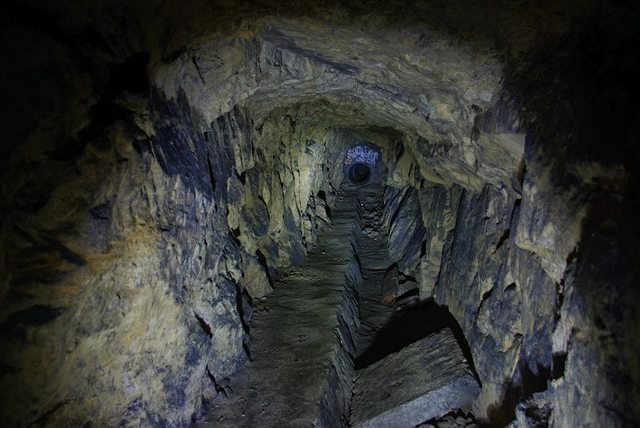 The small rotten ladders take you to a higher chamber which is sealed from the surface. 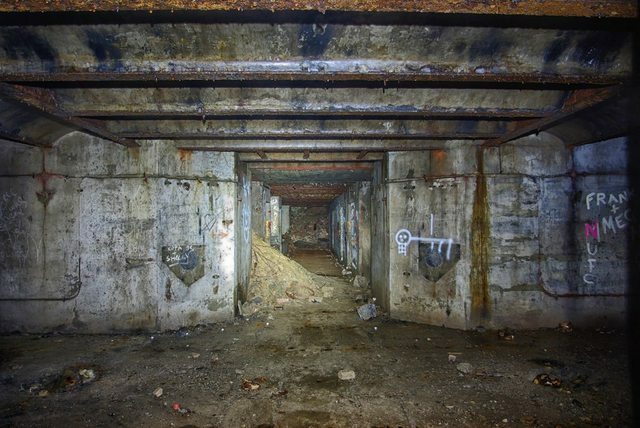 Back into the central passage and a closer look at where the gun was placed above. Next room is an electrical generating room. This held petrol engines with dynamos. 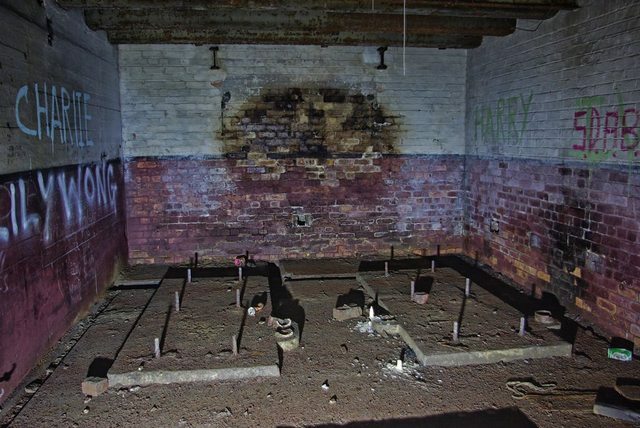 Aside from providing electricity to the site they also charged batterys in an adjacent (now empty) room. The smell of old engine oil in this room is still there - quite pleasant in fact! For all you graffiti fanatics. The whole battery is covered in the stuff - from the sublime to the silly. This is one example. BTW I know some of the people in the graffiti with some of them being friends parents! 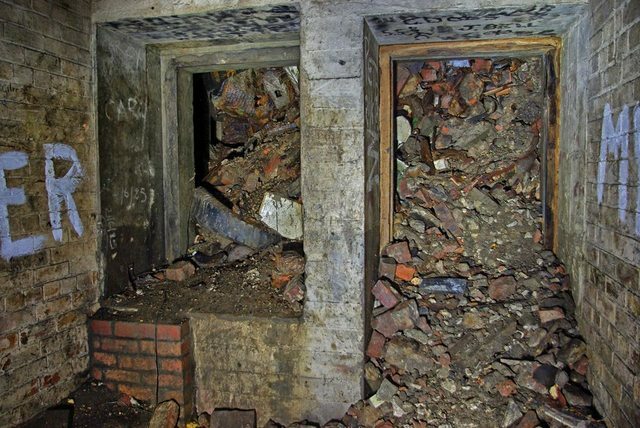 Next is where shells were stored. 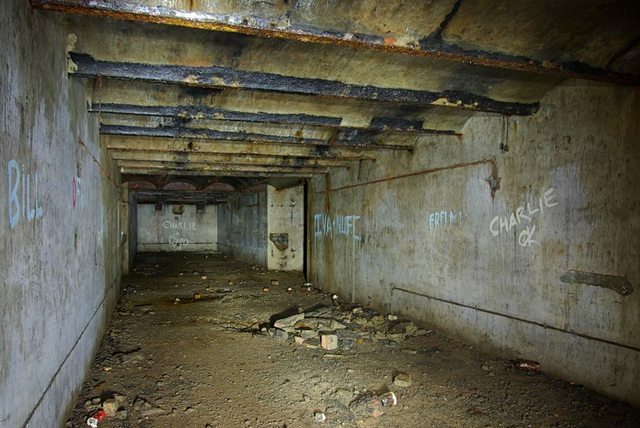 That storage area formed two chambers, one on each side of that central passage. Numbers of shells stored has several quantities stated but it did run into the hundreds. 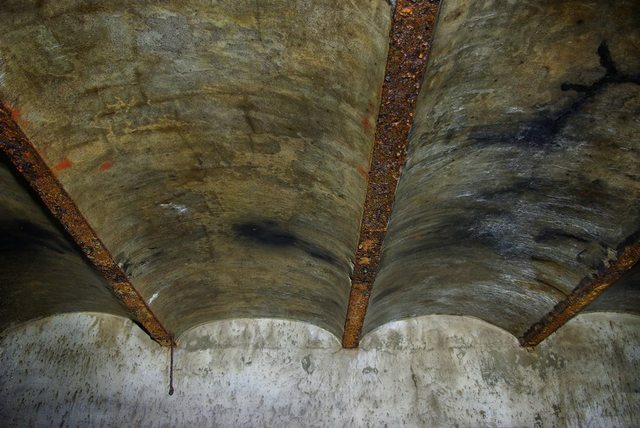 Typical roof construction in the battery. Finally, this is what greeted me in a dark corner of the battery. Yes I almost wet myself with fright. I wasn't amused! I think it's been there since the 1980s judging by the trainers and other clothing. So.. one off my bucket list that. Local and childhood memories - with many more like that still to do. Nah. Not scary as such (though that imp needs burning) it's just that the rubbish tip with potential gases and tunnel through coal bearing strata needs caution! The battery itself was one of those that mostly escaped the digital age. There are a few images around but nothing as detailed. All in I took over 400 photos to make sure I had it covered..
Owdo stranger, interesting one, thanks. I like this a lot, well done on putting the effort into getting into here! A very interesting Battery. Really enjoyed that. Your persistence paid off. Great set of pics too. Hello mister. Yeah it's a little bit tatty but worthy of posting I reckon - not had enough posts from up this way. Speaking of which, that ever growing list of 'targets' needs dealing with. I'll see what else the forum might like over the coming months. Last edited by Sausage; 24th Oct 18 at 19:29. Oh you have no idea how troublesome this location can be! I'm not allowed to post access info (I reckon they'll seal it fast) but suffice to say years of waiting and planning and the perfect conditions for the explore timed out perfectly. For reasons I can't say, I knew I'd be stuck there for 8 hours until I could safely and quietly escape out.. Thanks for that. 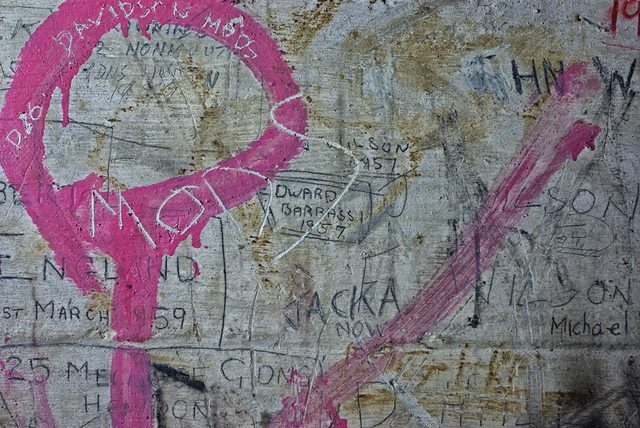 The pics are slightly processed but only because I wanted to show other people the graffiti details as their parents did it!